Cody Rogers possesses a lot of tools, both on and off the baseball field. Rogers, a 22-year-old Texas native with ample speed and power, was selected by Tampa Bay in the seventh round of the 2009 Draft. 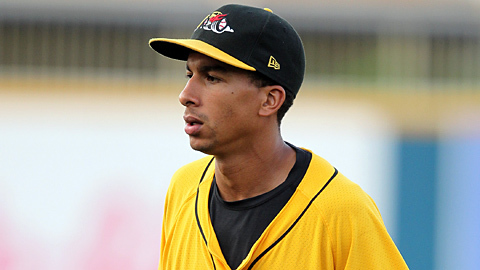 His 2010 campaign was marred by injury, but he recovered in time to spend July and August roaming the outfield as a member of the Bowling Green Hot Rods. And though the baseball season is undoubtedly grueling, once it ends Rogers reverts to an entirely different sort of grind -- as a prosthetic technician. He's been honing his craft since his junior year of high school, when a family friend hired him to help out around the workshop. "I started out sweeping and cleaning the machines, just trying to stay out of the way," said Rogers, who works in his hometown of Longview, Texas, during the offseason. "But now it's five years later, and in that time I've really learned a lot." Indeed. Instead of working in a janitorial role, Rogers spends his time crafting artificial limbs. "I'm making fake legs, mostly," he said. "Basically, it's a custom-molded bucket with a pipe sticking out of it and then a foot. It's more high-tech than that, obviously, but that's what it comes down to. ... I've gotten to where I do a lot on my own now -- a friend of mine and I run the shop part of the business ourselves. A lot of the work involves doing the same stuff over and over and over, but at the same time each [prosthetic limb] is different in its own way." Each prosthetic limb is different because it is custom-made for the client. Since personalization is a must in his line of work, Rogers has been able to meet a diverse array of individuals. "It's been a wide spectrum, from war veterans to kids to older adults," he said. "Diabetes is the main cause of the amputations, but it can be anything -- wrecks and accidents, all kinds of stuff. ... I'll break down the primary steps [of the process] for them, and they often think the whole thing is kind of weird. But I don't see it as weird; I see it as my job." It's certainly not a job shared by many -- if any -- professional baseball players, and Rogers often is asked by teammates to explain what he does. "It can be hard to explain and I don't want them to get freaked out by what I'm doing," he said. "They picture me working in some kind of basement or dungeon, with prosthetic limbs hanging on the walls." Once the baseball season ends, Rogers is ready to leave his teammates' -- perhaps willful -- misconceptions aside and get to work. "I know I always have the job waiting for me, but it can be tough getting back into the swing of things," he said. "It's like any skill -- if you don't use it for a while, then it can take a while to come back." Rogers also is spending a large portion of his time working out at his old high school, preparing for what he hopes is his first full season after 2010's injury-truncated effort (he hit .196 in 34 games with Bowling Green, bashing seven home runs and stealing eight bases). And though he plans on remaining in baseball for a long time to come, he is grateful to have something to fall back on. "I definitely have a passion for this job," Rogers said. "I enjoy helping people, being crafty and working with my hands. There's a lot about [being a prosthetic technician] that intrigues me and still so much that I haven't learned. It's like baseball -- you learn something new every day."